Bin Dajim owns fleets of more than 600 Trucks and 800 Trailers. Bin Dajim Group has signed Long Term Contracts with major reputed companies in Saudi Arabia. 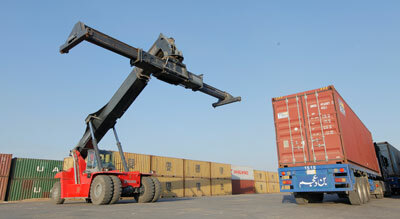 Bin Dajim is involved very extensively in Container Transportation. Bin Dajim Logistics (BDL) is a leading provider of comprehensive logistics and transportation solutions in the Kingdom of Saudi Arabia. The company with its base in Jeddah, from its inception has adopted and practiced a global policy for the provision of logistic services and their application in the local market. At BDL, we believe that qualified people produce excellent services, which forms the cornerstone of our business. Hence, we strive to attract and maintain the best talents who have worked with local and international companies. Our team consists of professionals with global and local expertise in the field of logistics. Along with an extensive network of shipping and forwarding providers around the world, we offer customers with all the services they need and hope for, through a single provider. BDL vision is to be a key partner in integrated logistics in GCC, offering & maintaining a higher quality of services to our valued customers. BDL is committed to being very aggressive in our attitude towards quality and customer satisfaction, we want to be ranked as the "best" in logistics industry. Quality is not just another goal, it is our basic strategy for future growth and development of our human capital.